If you’re up-to-date on your gentrification news, you may have heard that residents of four historically African-American neighborhoods in Atlanta are in the midst of an occupation of Turner Field—the former home of the Atlanta Braves. The organized resident groups have demanded, since 2013 when the baseball team announced it was leaving, to be considered and included in the planned development of 67 acres of commercial and housing on the land. So far, they’ve reported little to no luck in getting a community benefits agreement considered by the city or the developers, and they have escalated their protest to erecting a tent city on the property. Residents have been camped on the property since April 1 demanding that the proposal be acknowledged and addressed. In a project called the “deal of the year” by the Atlanta Business Chronicle, the City of Atlanta sold the land to Georgia State University (GSU) and the Carter, Oakwood Development and Healey Weatherholtz joint venture last year. Two resident groups, the Turner Field Community Benefits Coalition and Housing Justice League, have organized community members from the historic towns of Summerhill, Peoplestown, Mechanicsville, and Pittsburgh to push back against planned development they say has purposely excluded them. This community action is but one among several in cities around the country where longtime residents fear displacement at the hand of publicly supported private development, and have begun organizing against it. Earlier this year, young people in Boston staged a three-day sit-in at City Hall to shine a light on the need for more affordable housing units and increased community participation in the city’s rezoning plan. And in East Liberty, a neighborhood near Pittsburgh, Pennsylvania, longtime African-American residents were successful in stopping the replacement of 200 units of existing affordable housing for a new Whole Foods Market and market-rate housing. Despite their victory, residents say they are feeling constant pressure to move because of the rising housing costs that have followed the increased development. 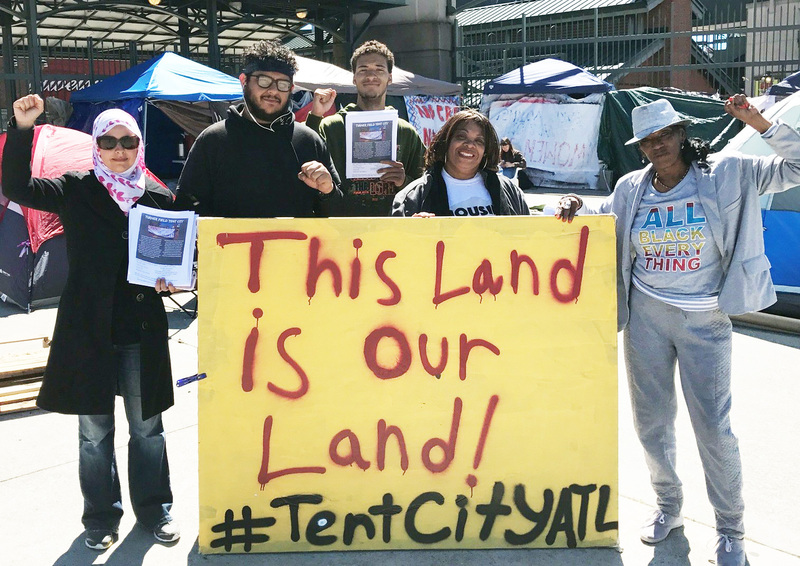 In Atlanta, the Turner Field Community Benefits Coalition’s proposal is at the heart of nearly two years of resident-led stakeholder engagement and includes housing, anti-displacement, and local hire provisions; public transportation and infrastructure upgrades; and increased educational opportunities for the affected communities. To fund these projects, the group has proposed an initial investment of $2.1 million for community services and amenities, and $20 million for affordable housing for low-income residents. The group also seeks a minimum commitment of $350,000 (or 10 percent—whichever is greater) of annual revenue generated from the facilities located in the communities. But organizers say that their proposal has been ignored, and the city and the developers instead cite community feedback received from a Livable Centers Initiative grant study in 2015 as proof that it has been a part of the process. David Nelson, senior vice president of Carter Development, and Andrea Jones, associate vice president of public relations and marketing communications at GSU, say elected neighborhood leadership have been involved in the planning process for awhile now and within the next couple of weeks, both Carter and GSU will have agreements worked out with the respective neighborhoods. Nelson says Carter, a longtime Atlanta business, and neighborhood leaders have been putting together a community investment plan, not a CBA, that touches on everything from public safety and workforce housing to transportation concerns. “We don’t come with all the answers, but we certainly do come together with open ears and a spirit of collaboration to try to figure it out,” he says, explaining that the company has been involved in “a couple hundred meetings” with neighborhood associations and elected neighborhood representatives, who pass information on to residents. While neither Jones nor Nelson could provide specific details as to what their respective agreements would include, Jones said GSU would share details with Shelterforce once the agreement was finalized. Sherise Brown, a community and tenant organizer, says that Carter Development has tried to communicate with TFCBC through the city council, but the group is confident in the body of work they’ve presented, and want a seat at the table. “[We] are surprised at the disrespect from the city and the developers. All we’re asking them to do is be good neighbors. It’s a myth that we don’t want anything. We are pro-development, we just want things that we can afford and the ability to work, live, play, and worship in our communities, too.” Brown noted that if considered, their CBA would be the first to be implemented in Atlanta. Over the past several years that the groups have been involved in this fight, Brown says, “What I have seen is resilience. People are not giving up, this is a fight for our lives. In an effort to ensure that more right than wrong will be done with the Turner Field project, Tanya Washington, a Peoplestown resident who is currently involved in an eminent domain court battle with the city over her home, announced last week that she will run for city council. Washington, a GSU professor, says she made her decision to run not only as a result of the eminent domain action, which she believes is ultimately related to the Turner project, but because she feels the city council member who represents her district is not working in the best interest of her consitituents. In her announcement speech, Washington said, “My experience with the taking of my property and [that of] my neighbors is that we need real representation. We need a representative for my district and not a liaison between my district and the mayor’s office,” Washington said, referring to city council member Carla Smith. “My district is about to be the beneficiary of a great deal of resources. And I want to make sure those resources are made available to people who live in the district currently and have been long-term residents of District 1, not just those who are attracted to the district because of the development that’s planned for the area,” Washington said. More Power to the residents in Atlanta occupying abandoned Turner Field. Where are the organizations going online to raise money to support their efforts? Politics cannot be our only focus this day. The fight to gain Freedom from Fear and Want is a multi-faceted thing. Hope that the thought of sustainable, democratic affordable cooperative housing becomes part of their demands for their and their children’s future and that of Atlanta. It’s crazy that there are people trying to rid themselves of a community that has been there for awhile. However, if the land was owned by the Atlanta Braves and they left, it makes sense that somebody will choose to purchase the land. However, when there is historicity, that needs to be taken into context. What you said Herb Fisher makes sense, because in order to get the Turner Field kept, they are not able to be silent. If they are silent, the land will be gone, and all they will have our regrets. What you said about having funds to support the cause is necessary, because unless the whole city decides it does not want to do it, it may just be a silent cause. http://www.treeservicesatlantaga.com. If the businesses fight on their side, then they may have a better stand against the big corporations and companies instead of being individuals that may be run over. Great article Shelterforce! I was able to feel the pain of the residents; the pain of the people to keep affordable housing instead of getting a Whole Foods.